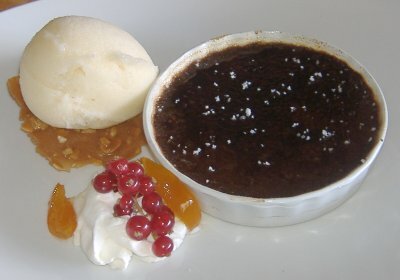 Both came with caramelized kumquats and red currants as garnish. 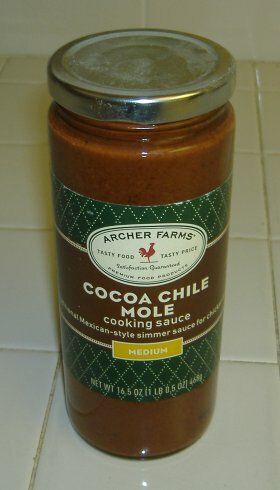 If you think chocolate and chile pepper spice sound weird together it's actually pretty good and almost like a reverse mole sauce with lots of chocolate and a little bit of spice rather than mole sauces that have a hint of cocoa to them. So, with over 200 reviews on the site now it's kind of strange that this is only my second review of a taco truck. It's not that I have anything against them. I just don't see them that often. 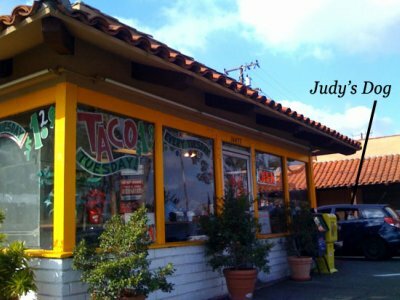 After a recent e-mail from frequent guest writer here Johnny Automatic urging that I get to a taco truck soon I went to Yelp and asked where I could quickly find one from my residence in Irvine. A Ryan C. there mentioned Alexa's near the Tustin Marketplace. Turns out that it is even technically in Irvine. A taco truck in Irvine? Sounds scientifically and philosophically impossible but it's true and they have some good food. Alexa's parks behind the Sprint building there Mondays through Fridays at 10:30am and 1:30pm for about half an hour each time (from what I could tell). At other times they are at different spots in the same industrial complex. 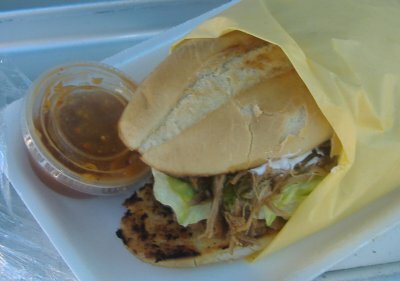 I went the next day after find out about it and ordered a carnitas torta, a big thing with hearty, toasty bread, tender carnitas, lettuce, sour cream, and guacamole. Some places might charge $6 - 8 for something like this but here it was $3.75 . . . and perfect. 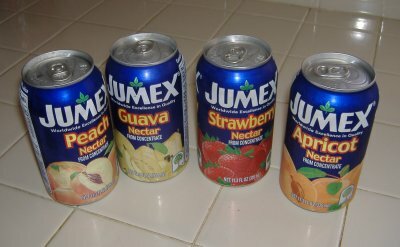 I looked around in their drinks section for a Jarritos soda but didn't see any. I kind of thought, "Hmm, a Mexican catering truck without Jarritos? Is that how they allow it in Irvine?" 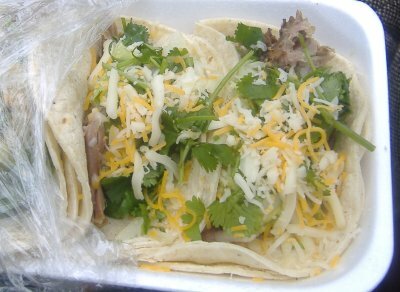 The taco was $1.50 and you can choose from carne asada, chicken or carnitas. On Tuesdays they have Taco Tuesday with dollar tacos and other kinds of meat that they don't have on their other days. Being the huevos rancheros fan that I am I asked of I could get some at lunch time and they said you can always get breakfast items from them. These were more like huevos rancheros tacos with two fried eggs, over easy, each in their own corn tortilla and just the right amount of ranchero sauce for somebody who's taking a quick break from work and probably has to walk back to their desk with a plate full of food and a drink. Speaking of drinks, on my second visit they had some Jarritos sodas available and said they had sold out the day before. 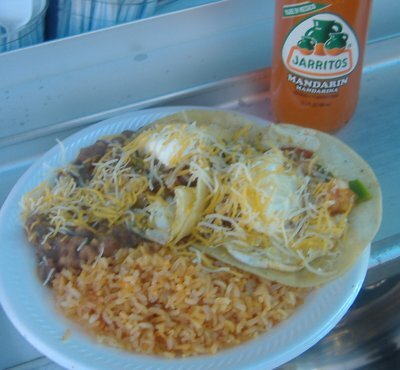 My meal on the second day came to a whopping grand total of six bucks for the huevos rancheros, the taco, and the soda. 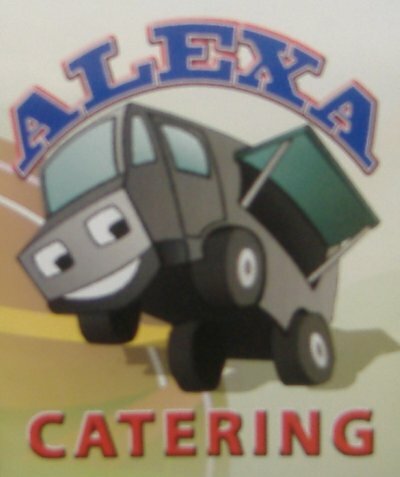 They also do catering. Call their number at the beginning of this entry for more info. 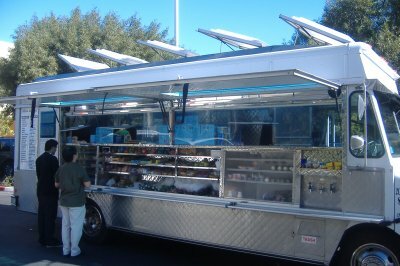 If you've been to Alexa's or if you know of other taco trucks I should try please leave a comment. Click here to see the unedited photo album (18 photos) at . 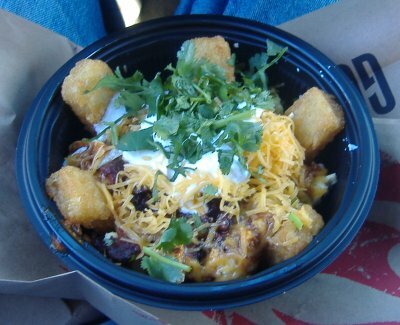 The Del Taco press release for this item calls it a "A hearty bowl of hash brown sticks, scrambled eggs, jalapeno bacon and topped with chili, sour cream, cheddar cheese and cilantro." Getting ready to post another restaurant review (probably later today) but just noticed at The Astute Recorder that outgoing President George W. Bush is a big fan of Mexican food. How come I never found that out until his last full day in office? Hopefully President Obama also likes him some Mexican food. Since it's the weekend when traffic tends to get a little slow I'll finally put up this entry that's been sitting around in Draft mode for a while. Target? Yes, Target. 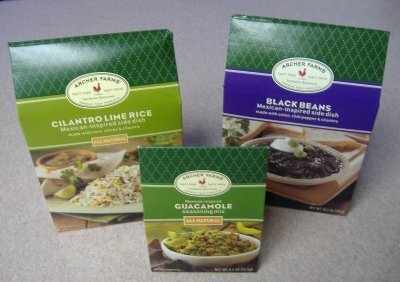 This is the next in a series of how to put together Mexican meals using only ingredients purchased from one particular supermarket in Orange County. We'll see that it turns out to be a unique experience at each place. 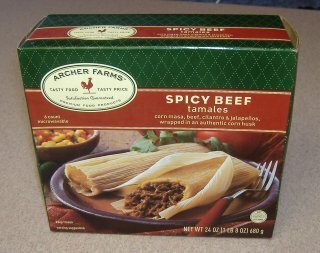 Target actually has a fairly wide selection of Mexican food offerings and a lot of it comes from its Archer Foods brand. Some of the following items will be available at just about any Target you go to while some will only be stocked at Targets that have a supermarket in them. Their cilantro lime rice comes from heaven. I tried mimicking Wahoo's cilantro rice on my own one time and it was a disaster. 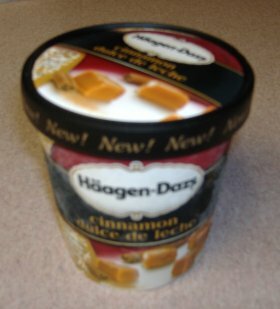 Now, with Target's help (go figure) I can finally make it at home. 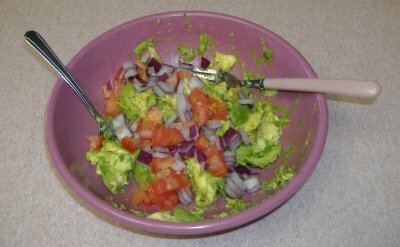 The guacamole mix is great too. 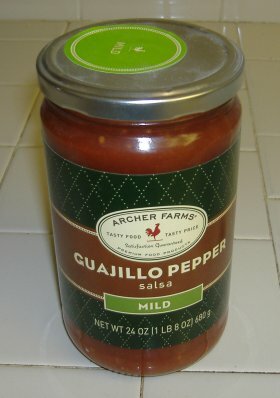 Now every time I make guacamole I want to have a pack of this stuff to add in. 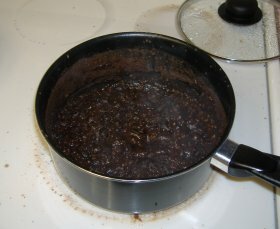 Since I'm not much a bean guy I can't really recall how good the beans were. All the items in this entry were purchased from Target. 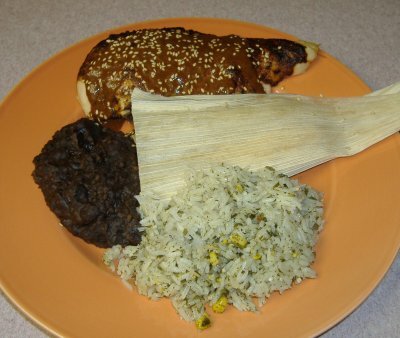 In the future we'll cover ways to make Mexican meals from items purchased at other markets. If you have a suggestion please leave a comment. Here's a review I've had sitting in the pipeline for a while because I'm not sure exactly what to make of this place. It used to be Ferdussi Persian Restaurant which I'd been to one time before and if I remember correctly I think I liked it then but now that it's a Mexican restaurant I think it's still run by the same Iranian family. At least the cooks are Mexican. I ordered or thought I ordered a chile relleno and taco combo and got the taco on another plate. 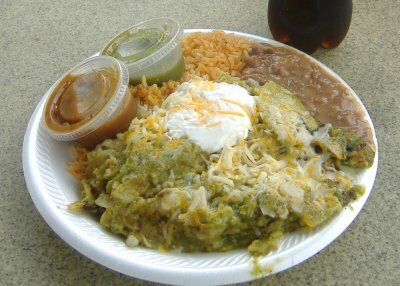 The chile relleno was plump, almost oozing with cheese, and had its own chunky sauce on top. 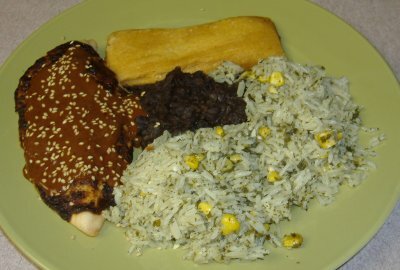 The beans were standard with a little bit of grated cheese on the top and a small helping of rice next to it (I know I'm weird but I always like more rice than beans and it hardly ever works out that way and I always forget to ask for it). 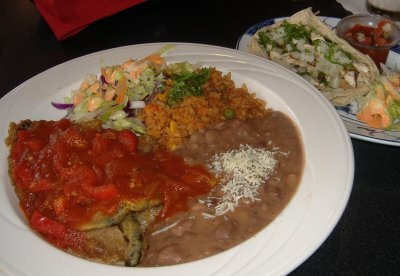 Both the taco and the chile relleno plates had a helping of salad which I have recently learned is called "garnish salad" and may be the first "garnish salad" I've seen at a Mexican restaurant that was served with Thousand Island dressing. The taco was the highlight, served in two apparently freshly made, thick corn tortillas with juicy cubed chicken breast and cilantro and onion (mildly surprised it wasn't lettuce and tomato) and an even chunkier salsa than what is served with the chips. 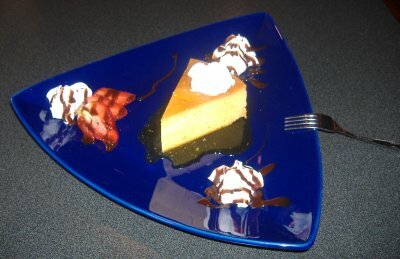 The flan was sliced from a bigger ring of flan and served with dollops of whipped cream with chocolate sauce and strawberry slices. 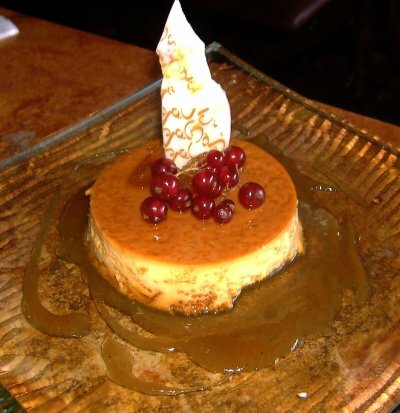 At $5 I wasn't expecting my flan to be gussied up like this. Nice touch at a decent price. 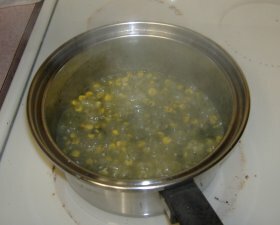 I liked my food but had a hard time knowing how to evaluate the whole experience. Business there was a little slow and they had just a temporary banner hanging out front. The host who seated me said they weren't entirely ready to make their presence known to the public yet so I think I could get a better idea of them if I went back. Click here to see the complete album (8 photos) at . 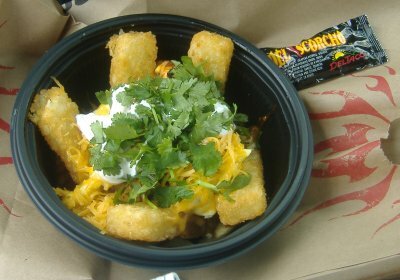 (Lake Forest, CA) Jan. 12, 2009 – This week, Del Taco takes value up a notch when the company introduces, not one, but three new $3 meals; complete meals that include a drink. In addition to popular Del's Deal and the new Classic Combo Deal, Del Taco is adding a Value Deal with a chicken soft taco, half-pound bean and cheese burrito and small drink. Del's Deal, which includes two half-pound bean and cheese burritos, a regular taco and small drink, was first introduced in early 2008 and the Classic Combo Deal with a Classic Taco, Del Combo burrito and small drink was introduced in October. If I only had a $1 left in my pocket, I'd scrounge up some change and buy a Taco Factory taco on Taco Tuesday. 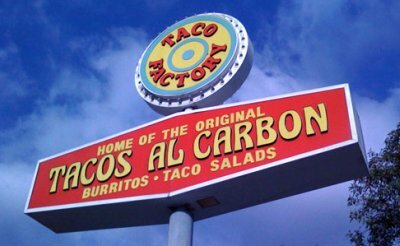 So the story goes, in 1983, Taco Factory ("Tacos al Carbon") in Tustin opened on the corner of Walnut and Newport. 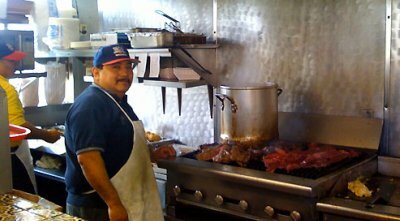 Soon after, various other small Mexican food joints opened by the same owner, all of which he (or she) sold. If my account of the restaurant's history seems vague, it's all thanks to my faux and inadequate investigative reporting venture while talking to one of the employees. While the friendly cashier was informative, there were several details she could not confirm. For one, she couldn't tell me who the original owner is and where the other "original" locations are. She could, however, tell me the Tustin Taco Factory is not affiliated with the Taco Factory locations in Irvine—which Christian has reviewed before—and the Tustin Taco Factory has been owned by the same folks for about 10 years. 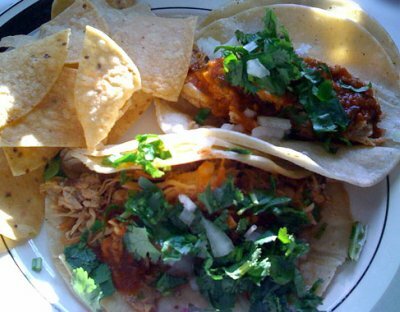 When I first started eating at Taco Factory in 2000, I was introduced to its high-value $1 tacos on Taco Tuesday. Completely impressed with the freshly grilled carne asada—both tender and free of lard clumps (can I get an Amen? )—I now find myself to be a Taco Factory obsessed patron regular in the purest sense of the word. 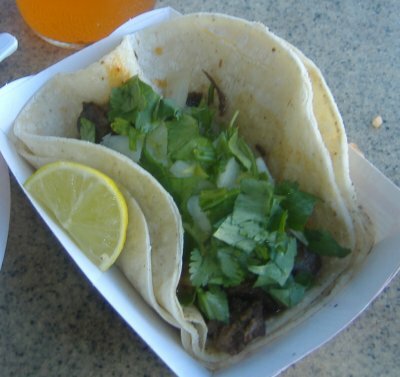 Most of the dozens of times I've eaten at Taco Factory in the past nine years, I've ordered the carne asada tacos, and I eat them the same way, all the time: spicy pico de gallo, which TF features from mild to extra pica, spread over the meat with a few dashes of salt. 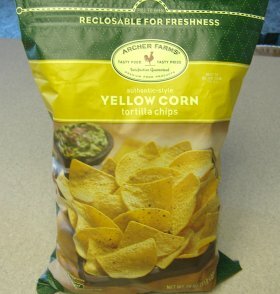 Then I dip my freshly deep fried corn chips in for the kill. I enjoy most of my tacos as this kind of chip-dipping experience, then, when there's just the right amount of meat, I pick up the meat filled corn tortillas to eat them as tacos. It's truly divine. 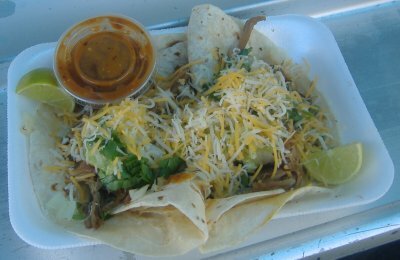 Equally as enticing are the carnitas (pictured)—juicy, flavorful and boasting a saltiness and texture reminiscent of Kalua pork. 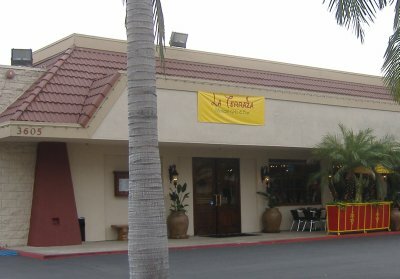 Because I am a Pacific Islander, the latter description earns Taco Factory's carnitas tacos a double thumbs up from me. These I enjoy with hot red salsa topped with diced onions and cilantro, then—once again—with another chipping dipping until it's bite-sized taco experience. 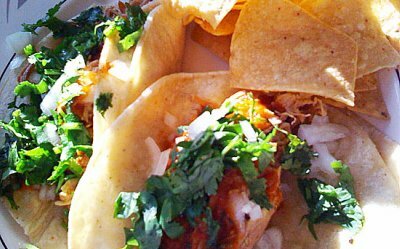 The cod fish tacos are just as meaty and chicken tacos are transcended from typically boring to tasty and plentiful when blended with any spicy delight from the salsa bar. Just about the only thing that seems to have changed since I first became hooked on Taco Factory is the price range. Tacos are now $1.29 on Taco Tuesday ($1.85 every other day) but one can still get a meat and cheese filled burrito (the famous burrito) for less than five bucks ($4.75). 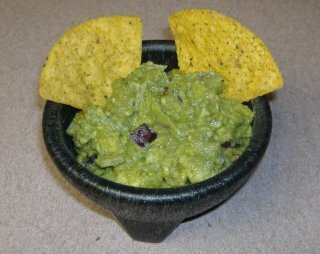 This popular dish comes with fresh guacamole, which is fresh and creamy, featuring the cuisine's signature flavor of cumin. 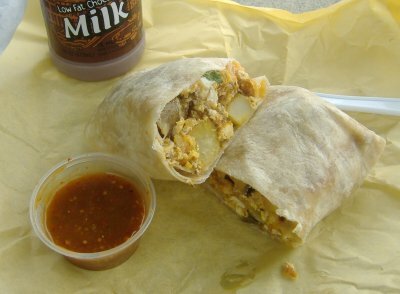 The wet burritos ($5.29) are worth blowing any diet for. The red sauce has a mouth-watering tang and the right amount of melted cheese accenting the green onions and diced red pepper on top and ample meat filling. I've had just about every dish on Taco Factory's menu (while getting friends and family members hooked along the way), except dishes implying healthy eating (taco salad, tostada, vegetarian taco … you get the idea). 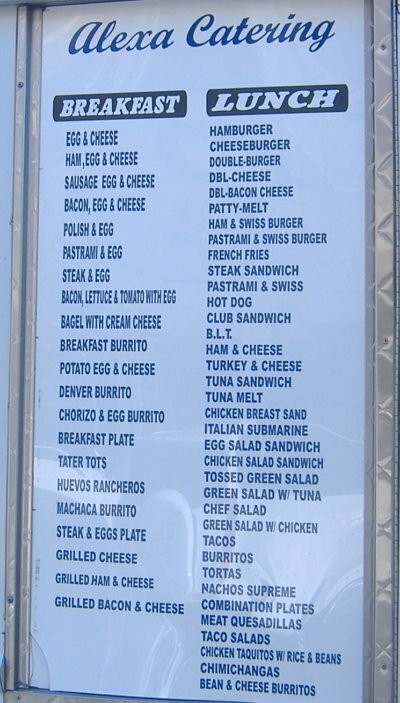 But rest assured for interested parties, these items are on their menu with the highest priced of those listed as the taco salad ($5.49). Taco Factory can even make a quesadilla sing. These tortilla and cheese favorites come in small or large sizes. The quesadilla is straight up a tortilla with cheese (small, $2.69 and large $3.59) with the quesadilla plus that includes a meat (small $4.29, large $4.99). Given the price, it's worth it to order a large quesadilla plus (scrumptious with jack cheese and carne asada), which can pretty much account for two meals. Other than the prices, everything else seems to be the same at Taco Factory—the cooks, the cashiers, the salsa bar, the interior, the daily specials and yes—the Taco Tuesdays. 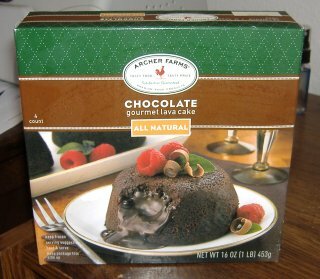 This is a good thing for folks like me who look forward to the hearty and affordable eating experience. If anything, Taco Factory in Tustin seems to have its finger on the pulse of recession-proof restaurants all thanks to a formula that works. 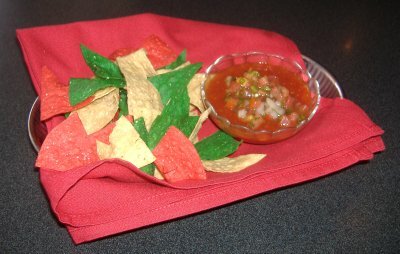 Judy "the Foodie's" hot (salsa) tip: Mark your calendar on your birthday. If you show your I.D. 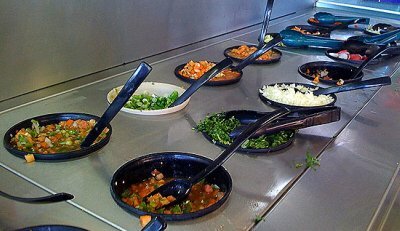 at Taco Factory, you will enjoy a free lunch on them! 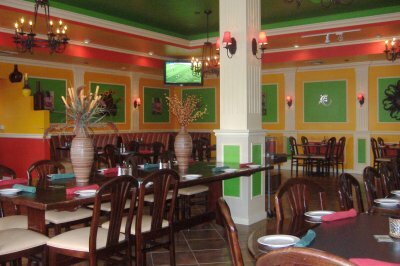 Also there are daily specials seven days a week and lunch and dinner platters ranging from $3.50 - $7.00. One counter on the inside. 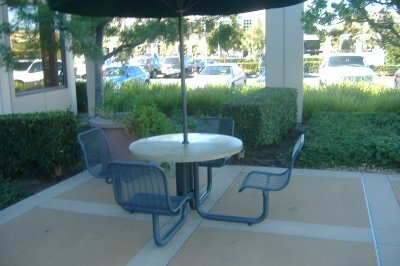 Plenty of tables out in the patio. A few spaces right in front but the eatery is in a small strip mall where there are more spaces. Some street parking in front. One space for handicap parking. Friday – Saturday: 9 a.m. – 10 p.m.